Women match their mangalsutra with earrings, and demand for gold jewellery designs that are unique in style. A diamond mangalsutra is matched with bangles, earrings and finger rings. A gold mangalsutra can be paired with a gold necklace, bangles, earrings, armband, waistband, etc. Women these days, pay special attention to their mangalsutra, as it is one of their important assets. On many occasions, just a simple mangalsutra paired with earrings looks elegant and classy. In India, the mangalsutra holds a special significance in every married woman's life. In the Northern regions of India, this auspicious thread is called 'mangalsutra', and in the Southern parts of India, it is called 'thaali'. The name further varies according to the different castes and sub-castes; but in the end, this auspicious thread holds the same value and importance in every woman's life in India. 'Mangalsutra' is the auspicious thread that symbolizes the marital status of a woman. The groom ties this auspicious thread around his bride's neck, at the wedding ceremony. This thread is made of a gold pendant and black beads. Black beads are worn to ward off the evil eye and to have a flawless marriage. In olden times, women wore this auspicious thread around them at all times. However, as times progressed, so did the traditions. These days, women wear the mangalsutra only on special occasions, to match it up with their traditional outfits. Though we cannot completely deny the fact that, many women follow traditions and wear the auspicious thread all the time. In any case, this thread plays an important role in the lives of married women. Many jewellery stores these days have started showing their creativity in the making of this auspicious thread, which is more evident. Very Nice Mangalsutra Design. We can buy Wedding Wear Diamond Jewellery at Eves24 in Mumbai. They have a huge variety of Bridal Jewellery as well as Diamond Jewellery. Very nice Diamond Ring For Women. Gifting a Diamond Ring to your dear ones is a best moment to see joy on their face. We can buy Diamond Engagement Rings from Eves24 and many more places in Mumbai. Have a look at these Antique Silver Jewelry designs too! Nice Blog! 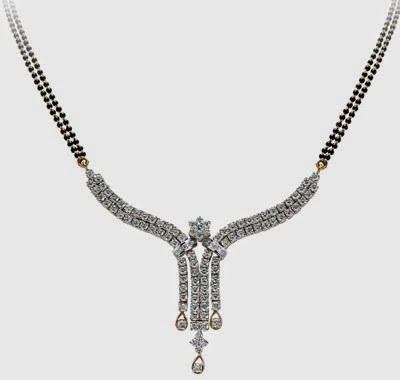 The design of Mangalsutra looking beautiful. Thanks for Sharing, Even you will get the variety of designs at Best Diamond Jewellery Shop in Bangalore.